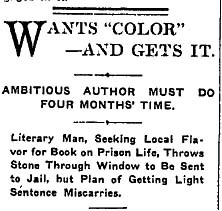 In grappling with a novel about life in prison, writer Ernest Filer of Chicago decided that he should experience imprisonment for himself , thus he hatched the idea of breaking a window so he would be sent to jail. He selected a small pane of glass at a cigar store and heaved a rock through it, assuming that he would be let off with a reprimand, a day or so in jail and an order to pay the cost of replacement. 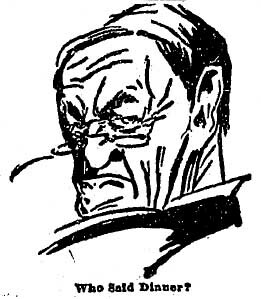 The Cook County judge, however, took a dim view of his literary endeavors and “sent him to the stone pile for four months with instructions that he be kept at hard labor,” The Times reported. History, alas, remains silent on the Filer oeuvre and he apparently awaits his rediscovery and a compiler of his catalogue raisonne. Pity the fate of distinguished tea expert Isaac McGay, who died at his home in Yonkers, N.Y., after three years of declining health blamed on more than two decades of government service testing the quality of tea to ensure that import duties were properly assessed. “Tea merchants all say sampling teas always affects the health of those engaged in it,” The Times noted. Shout out to the Marsakster: Obviously not Yogi tea. Unable to control his automobile because of drunkenness, it is alleged, A. T. Munns drove a big touring car into a team belonging to Arthur Cohn, a grocer at 512-514 W. 7th St., last night and injured one of the horses severely. Munns was taken to Central Station and booked on the charge of drunkenness. According to the witnesses, Munns was driving at a high rate of speed. Two hours after William Cummings was locked up in the City Jail on the charge of drunkenness, together with a woman who, he claims, is his wife, but who gave the name of Stella Steely, last night, he attacked several prisoners in the drunk cell and injured two severely. An officer found Cummings and the woman on 1st Street between Spring Street and Broadway [Note: That was a block from the Central Police Station—lrh]. They were attracting attention by an argument as to whether they were married. Cummings seemed to be quite peaceable when placed in the cell but later cut and bruised Thomas Ryan and Charles Burk so seriously that they had to be taken to the Receiving Hospital. Author Mark Twain is aboard the yacht Kanawha, which is missing somewhere off the coast between Cape Hatteras, N.C., and Norfolk, Va.
A Southern Pacific train with 208 passengers, many of them Shriners en route to Los Angeles, is wrecked 20 miles south of Raton, N.M., when an axle breaks. Twelve passengers are injured, 10 of them seriously, and the traffic is delayed for 15 hours.